Leinster and Ireland back-row Kevin McLaughlin has retired on medical grounds after suffering concussion against Edinburgh earlier this month. The 31-year-old was advised that it would be in his "best long-term interests to stop playing". McLaughlin, who was capped eight times by Ireland, won two Heineken Cups in 115 appearances for Leinster. "It is upsetting and frustrating to have to retire when I feel I have so much left to give," he said. "However, it is the right decision and I am glad that our medical staff were so proactive in encouraging me to see a neurologist and getting his expert opinion. "The support I have received from the club and my team-mates has been incredible and will help to soften the blow of having to retire from the game I love." McLaughlin sustained concussion in the Pro12 opener in Edinburgh and was referred to a neurologist "due to concerns about his increasing susceptibility to concussion and the length of recovery". 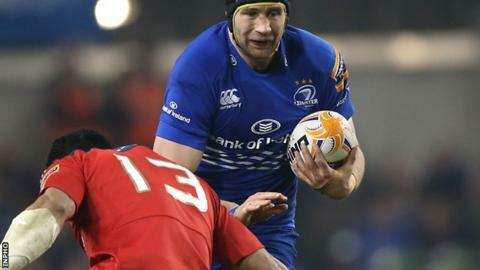 He also won the Challenge Cup and three Pro12 titles with Leinster, while his last Ireland cap came against New Zealand in November 2013.